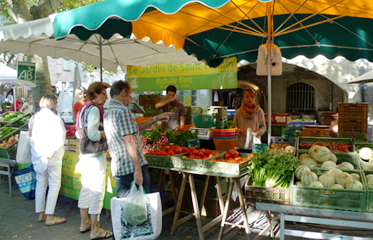 Uzès is a town where people live and work, where the market is for locals - not just for summer tourists. Yet 50 years ago, the town was dying. All the old buildings were dilapidated and deserted, and no one wanted to live in them. 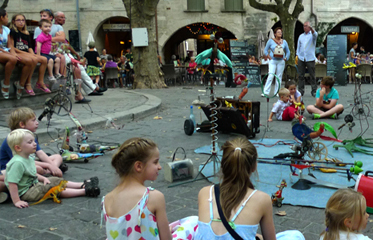 Then the French government designated Uzès a historic town and a ville d'art, and invested money in its revitalization. One Uzétien said: "Here, inland and on the unfashionable side of the Rhône, there's something more authentic than you'll find on the coast". Today all of approximately 10.000 inhabitants are enjoying every corner of the city but the Place aux Herbes, with its central location, is its hearth. 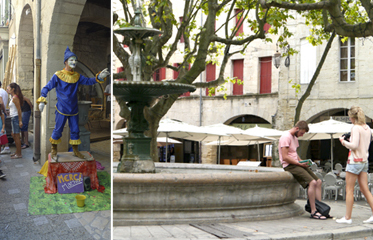 It is a typical medieval square, masterfully restored to show all of its greatness. It is lined with arches all around, filled with shades of plane trees, and cafes and restaurants for all possible tastes. Our first contact with the city was on this square. After a drive from Marseille airport we parked on the boulevard surrounding old city and walked true Rue Froment. We entered the square under the archway full of the people having good time in the caffè on this sunny day. We were lucky to have accommodation just a steps away in the number 10 Rue Du 4 Septembre. House we stayed was built in 10th century and rebuilt in 14th! Architect owner bought it decade ago and injected new life in it. Spaces like this deserve much more attention so we dedicated our psychogeograhical walk around this space a special page.